So many people I work with are looking for quick wins when it comes to their health and eating habits. One of the biggest opportunities I see is for people to stop eating the same way 365 days a year. Quite simply, we are not wired to eat the same way all the time. Ancient healing sciences like Ayurveda and Chinese Medicine have taught this for thousands of years, but in the West, we have long forgotten this simple truth. The seasonal food movement is too often seen as some kind of fringe alternative diet, but anyone who has studied even just the basics of the energetics of food knows that nature provides us foods in each season that specifically balance the predominant energies of that time of year. Melons and cucumbers are cooling and abundant in summer. The root vegetables and heavy squashes that make their way into markets in the fall are grounding and help us navigate fall’s airy tendencies. In the spring, cruciferous vegetables like cauliflower reach their peak and counteract sluggishness that tends to accompany the onset of spring. All of this is important not only because growing cycles fluctuate, but modern science is now catching up and finding that our healthy gut bacteria change throughout the course of the year. Our bodies are not designed nor equipped to digest the same foods optimally year-round. A ground-breaking book published earlier this year, The Plant Paradox, also reveals a well-researched case for how foods eaten out of season contain high levels of lectins, which are naturally occurring compounds that are intended to protect plants from human predators. Excess lectin consumption is associated with destroying gut flora and increasing risk for a range of digestive issues, including leaky gut syndrome. Finally, consider that the amount of food our ancient ancestors would find on their plates would wildly vary from season to season. Winter meals were often lighter in nature, while meals in the summer and fall harvest season would be more abundant in preparation for the scarcity ahead. In a time when food is hardly scarce for so many of us, we have a tendency to overeat all the time, or to not be mindful of the natural hunger patterns that arise within us. Many of the clients I work with will find an eating routine that seems to work for them, and then are mystified when several months down the road, that diet no longer seems to serve them. This is evidence of how our digestion is not a static system, but rather an ever-changing complex microbiome. By the same token, the way we eat at age 30 will often look very different from how we ate at 20, and so on throughout our lives. The most important key to maintain healthy digestion for life is to pay attention and seek help and try new things when things seem to go off course. · Shop at your local farmers market. Choose organic producers or farms that sell different things throughout the year, as they tend to be more in sync with what’s in season. 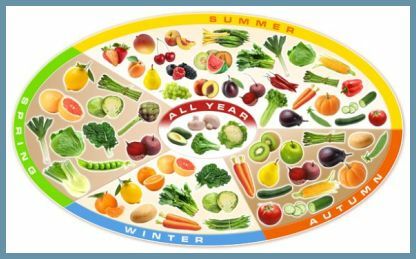 · Get to know seasonal growing cycles. If you don’t have a year-round farmers market or prefer shopping at conventional markets, research what crops are in season during each part of the year. The L.A. Times has a fabulous online resource for Southern California here (it also loosely correlates to growing seasons nationally, with some crops coming into season later in colder locales). Choose fruits and vegetables grown in the U.S. as much as possible, with Mexico as a secondary source. Avoid fruits shipped in from South America and New Zealand. · Vary the quantity of food you eat throughout the day. Tailor the size of your breakfast to your morning hunger levels. Lunch should be your largest meal of the day, as it is consumed at the time when your digestive fire is burning its brightest. Keep your dinners on the lighter side and don’t eat too late into the night, especially in the winter. If you need support adding variety to your diet, I can help. I offer individual consultations, menu planning assistance and personal chef services that can help you diversify your diet. Use the contact button below to reach out.